The Nagas have a rich tradition of art and craft rooted in a lifestyle that has always been in harmony with the environment they live in. Their utility items, weapons, costumes and textiles for the home are all created by deft craftsman of the tribe, with each having a ritualistic or aesthetic value. All the 17 tribes from Nagaland (as recognised by the Indian state) are united in their love for color, their adornments borrowed from the environment they live in and their creation of all the utility items including clothing, jewelry, headgear etc., with the skill of a true artisan. The motifs and design details vary with each tribe, being markers of their unique identities. 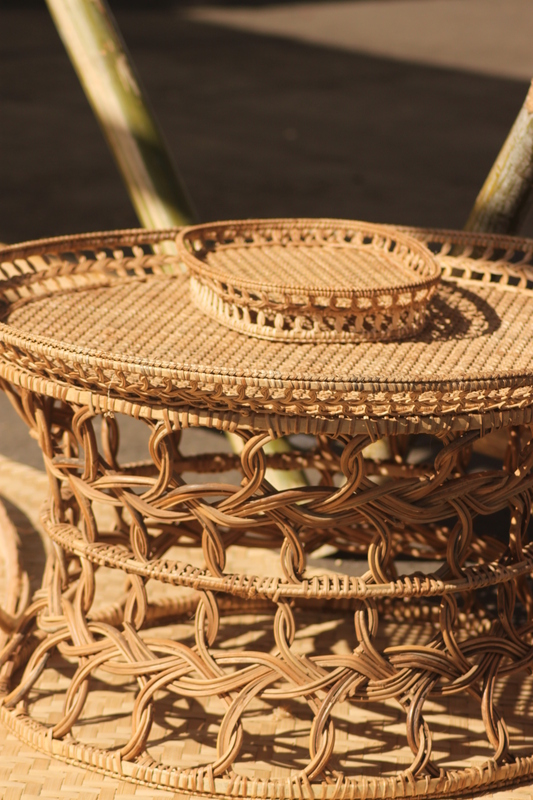 Bamboo and cane baskets created by Naga tribes are recognised for their immense utility and aesthetic value. Even headgears and mats are woven by thin cane strips. Those created by the Khiamngan tribe or coming from the Khonoma village are most popular. Weaving is done exclusively by women in Nagaland and surrounding areas. The backstrap looms resemble those of Peru, Guatemala and Indonesia. Each tribe uses distinct colors and motifs that are often based on tribal folklore. Natural dyes extracted from barks, roots and plants were used for dyeing cotton yarn and woven fabrics. In addition, woven cloth is often embellished with beads, cowrie shells and goat hair to denote the wealth and status of the weaver. The backstrap loom is one of the simplest looms with no devices attached. Here the continuous warp is stretched between the two parallel bamboos, one end tied to the post and the other held by a strap at waist by the weaver. The small loom is portable but requires strenuous work as it has to be rebuilt everytime. Pottery, though not a widely practiced craft in Nagaland, is still a craft that showcases the unique motifs of the tribes. The work is restricted to women who do not use the revolving wheel. Instead they have a unique method of making pottery with hands and the techniques tend to vary according to the tribes and the geographical areas they inhabit. The most peculiar feature of Naga pottery is that the designs and motifs are usually inspired by the designs of the textiles. 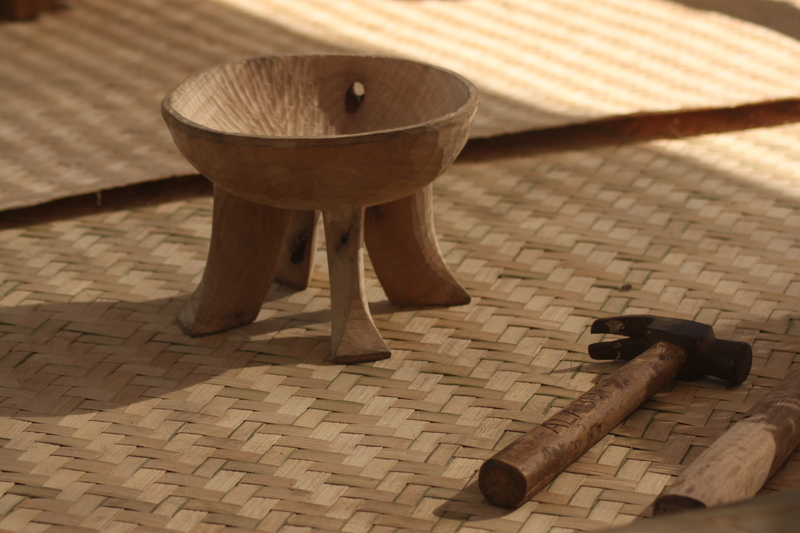 Using rudimentary tools like hand drill, chisel etc., skilled tribal craftsmen produce decorative items from wood. These can be seen adorning village gates and house posts or even as commonly used wooden dishes. The Shangnyu Village in Mon district is particularly famous for the work is a fine example of this unique craft from this region. Iron tin and brass are used to produce weapons as well items of utility and ornaments. The Konyak blacksmiths are famous for their metal work skills and the local weapons and ornaments are made by local blacksmiths to this day. The most colourful festival of the Konyaks, “Aoling Monyu”, which is observed during the first week of April every year, is one place to witness the unique costumes of this tribe, with the wood and bone headgear being a significant adornment among the men and the brass and bead jewelry being seen on women. Festivals are the best place to witness the distinct costume features of all tribes. The rich history of art and craft in Nagaland has resulted from the abundance of raw material, the environment in which the tribes dwell and the inherent skills of the people. The promotion of their work allows the tribal artisans to provide a window to their world, alongside earning as they continue to create. Posted in Crafts, Festivals, Nagaland and tagged artisans, Baskets, Colors, Costumes, Craft, Festivals, India, Jewelry, Nagaland, pottery, Tribes. Bookmark the permalink.